At Five Years To Financial Freedom, we have a lot of queries on how to make money fast and how to make large sums of money. However, we believe this should be the last question that people should ask us. Financial freedom is not just about finance, it is also about freedom. Just think how much real freedom you have, if you have lots of money, but are bed-ridden, or suffer from alzeimers, or have no friends. As a result, many of our articles also include key aspects to help grow your intellectual, spiritual, social and physical well-being. For this reason, we are particularly pleased to introduce you to Peter Allton, a family man who focusses on the physical well-being of others through curing and managing diabetes. Peter Allton has not only faced many life challenges but overcome them through education in growing a strong mindset, obtaining coaching, and most importantly having an incredibly supportive wife who takes a leading role in many of his endeavours. Surprisingly, in spite of all his accolades, when I first met Peter, Peter suffered from stage fright, a fear many have, and it has been my pleasure and privilege to see how he has faced his fears and grown as a result by living in the uncomfortable zone. In this video interview, I was privileged to sit with the award winning, Undefeeted Podiatrist, Peter Allton, to discuss how he found the time to not only write his book, Undefeeted but market it as well…on top of his demanding job, charity and caring for his family. This interview is focussed more on how Peter wrote and marketed his book Undefeeted, to share his insights with many of our readers who are interested in a writing and publishing their own stories. Abbreviated notes from the video interview are written below for those who do not have sufficient bandwidth for video. Four out of five Diabetes sufferers in the UK do not have adequate protection. Every 20 seconds somewhere in the world, someone is having a limb amputation because of diabetes. It is estimated that the amputation could have been avoided in 75% of these cases. Undefeeted shares great information to help people care for the health of their feet and to be aware of the health signs when they need to take appropriate action. Peter’s goal is to help people overcome diabetes through his practice, through his charity work, and through worldwide education via his blogs and books. Peter has nearly three decades of experience qualified as a podiatrist and has treated over 200,000 feet. Peter, himself, suffers from Type 2 diabetes, and so has the experience and education to successfully manage his condition. Watching and listening to Peter in conversation and with his interaction with his wife, Tina, I felt that the number one tip to being successful is to have a supportive spouse. Peter’s first piece of advice was the importance of setting targets for yourself. It’s crucial that you set a date for when you’re coming to complete something, this is so you have something you can stick to. One of Peter’s biggest challenges when writing his book was finding the time to focus and work. In Peter’s case, this was especially difficult as he has four children and a wife. However, Peter made a decision that he wouldn’t neglect his family. So what was his solution? He changed his habits and began waking up early in the morning to write his book. Peter also gave us his advice on product development. You’ve got to be open to other people’s opinions, it’s important to make sure your product or service works before you release it. You don’t want to rush things, having other people look over your work and giving honest feedback is essential to success. However, this needs to be balanced by getting it as good as you can and releasing it as fast as possible. When setting a time goal, make sure that you factor in product testing and product evolution. Finally, Peter shared his advice on marketing. Luckily, he had his publisher do a lot of marketing for him. With that said, he found that writing blog posts using the topics talked about in the book was a fantastic way of promoting his product. Similarly, he would write Facebook posts, and release snippets of the book on Twitter to help people understand what it is that he was selling, and to teach them about the issues raised in his book. I’d like to end my notes with a quote from Peter. How often have you said to yourself “my feet are killing me”! Whereas really you should be asking yourself “Am I killing my feet”? 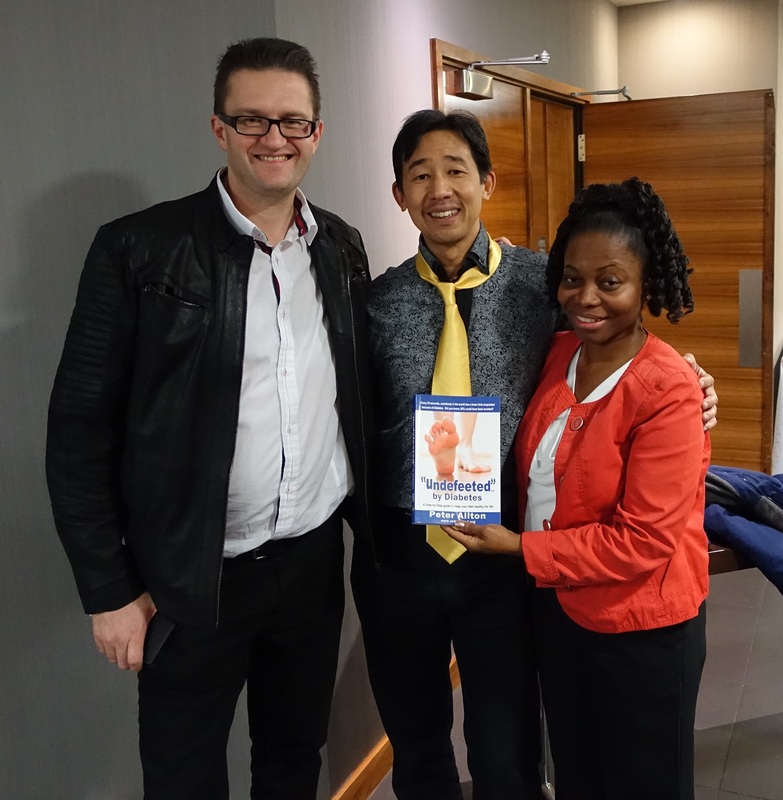 We met Peter and his wife Tina Allton at a JTFoxx event which focusses on helping successful people reach the next rung in their development. Here are a few other interviews with people we met at this event.